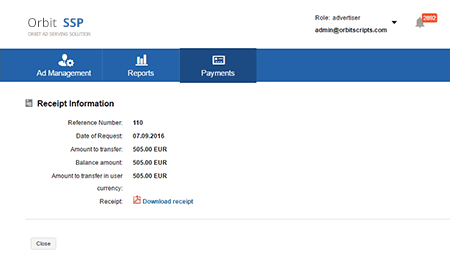 Increase your income by using the best independent software platform for the sale of your goods and services. Orbit Soft offers a truly transparent software platform with high-tech management tools that can effectively work with the data you manage interact with the DSP platforms on all devices including: desktop, mobile and video. Be confident that you are actually getting a fair price for each Ad impression your traffic generates with OrbitSoft Floor Pricing Technology operating in real time. The OrbitSoft SSP platform calculates the optimum value and the current value of each impression, based on geo, time, and other critical factors, then the software dynamically responds to changes and continually gets you and your customers the best price per impression. Receive additional income and access to new sources of demand by using Header Bidding Technology. Header Bidding provides access to a variety of DSP with rates from your direct advertisers, while allowing you to choose the most effective rate for your business model. OrbitSoft integrates into all mobile platforms and enables publishers to build a world-class business. SDK and various integration options provide specialized algorithms and flexible functionality for the effective control of the distribution of your advertising resources across all mobile sources. 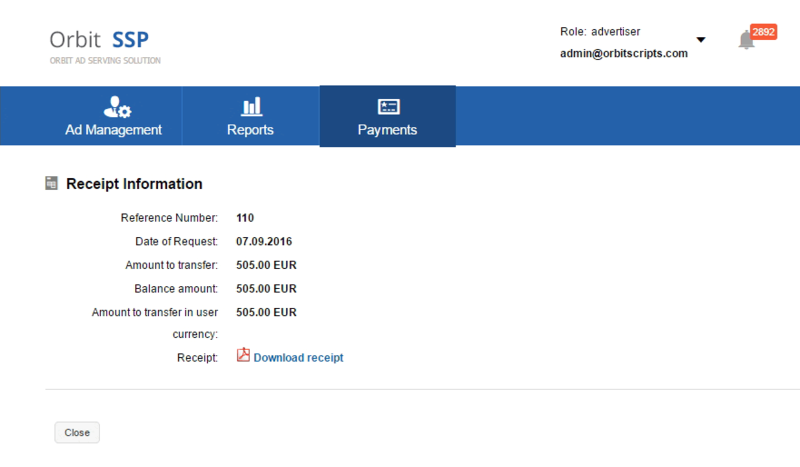 In addition to programmatic advertising, the OrbitSoft system allows you to build direct relationships with advertisers and agencies easily. OrbitSoft Publishers SSP allows you to sell inventory or audiences, conduct private auctions, or offering direct deals without the risk of data loss or privacy concerns. Custom software always keeps you in complete control. 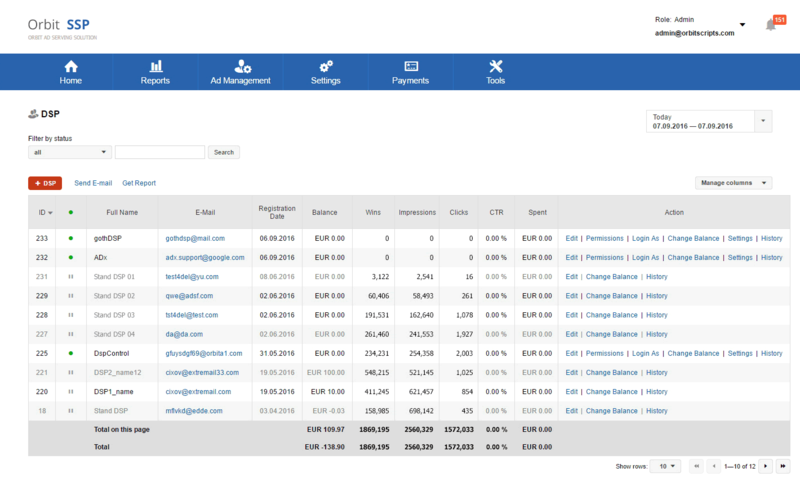 OrbitSoft Publishers SSP offers manual and automated audit tools, so you can easily manage the ads on your site and maintain your branding while strengthening your reputation. Built-in mechanisms for data analysis provide additional methods of ad quality control. Immediate access to key metrics of Ad performance include graphs and tables that can quickly provide information about the effectiveness of your entire ecosystem in easily digestible reporting visuals. Comparison of performance indicators make it easy to spot trends and analyze customers in a matter of seconds. 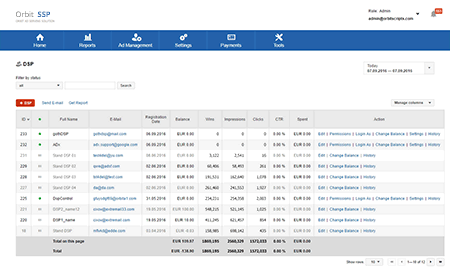 Website owners and application developers can easily manage all DSP connections with a single interface, while generating useful reports quickly. Reports are available upon request, can be generated on a periodic basis, and are easily exported in a variety of formats that save you time and improve the productivity of your team. Users have easy access to review payments, handle account management and examine financial analysis tools based on various metrics. Control and analyze your cash flow with a detailed history of transfers and automatic payments via electronic payment systems, bank transfers, checks, and other processing methods.